We’ve recently moved to a suburb in West Melbourne where the locals think yuppies are scum. I’m already picturing what kind of reception ‘Wallabee’ will receive when our shimmering vintage trailer turns up in the driveway. It doesn’t help our cause that Airstream’s marketers are currently targeting their trailers to those very detested “yuppies,” despite the company’s proud middle-American heritage. According to The Age, Airstream is opening up shop in Australia soon, priced around $120,000 to $140,000 for a 23-foot or 27-foot trailer. “They make a major statement on the road. That high price tag will get you a similarly inspired interior… with buyers able to select from a palette of interior layouts designed by the likes of US clothing chain Eddie Bauer and European fashion brand Ralph Lauren,” says company spokesman Michael Corbett. Why Airstreams are priced from $35,000 in the US but more than $100,000 in Australia for a left-hand door should have been in question, but anywhoo. I was fascinated by the bollocking the article received on the comments page (since removed), with the majority considering anyone who would spend $140,000 on a trailer to be a complete wanker. And it got me thinking about our own purchase. Are we now considered to be yuppies because of our choice of trailer? Will some people judge us because we care about aesthetics and want an attractive living space to travel in with our kids? Although we’re spending nothing near the cost of a new Airstream, by the time we customise our $7500 trailer and ship it to Australia it will definitely add up. But then what is the caravan alternative for full timers with kids? On a recent visit to the Melbourne Caravan, Camping and Holiday Supershow, before we decided to import an Airstream, the majority of caravans we perused were furnished in gingham, beige or lilac and aimed squarely at grey nomads (the 55 plus retirees who make a long pilgrimage around Australia). Not for the retro-loving, hip family we think we are. So this is is a message for all those haters out there. Lay-off the labelling. Not all Airstream owners drive luxury cars, wear designer clothes and play Beethoven. But we’ll choose the glamorous and shiny trailer any day, even if it means copping your abuse. Aesthetics are important. Boganism is not. Wear the airstream with pride and blast Beethoven if you feel like it. I could not have said it better. We live in the United States and have the opposite issue. We live in a neighborhood where campers are considered low rent. Our friends and neighbors have come to appreciate our Airstream. In the end, you make choices based on the needs of your family rather than what others will think. I love reading about kindred spirits with an Airstream on the other side of the planet. 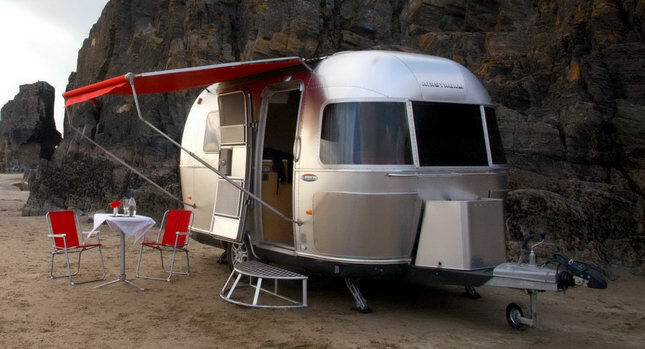 Australia would be a great place to Airstream. I look forward to following fellow Airstream bloggers. Thanks for your message Doug. I equally love other Airstream blogs and look forward to sitting down with a cuppa and reading about your recent adventures. We are about to head off to California to organise the return of our beautiful 1987 Airstream to Australia. I imagine we will cop a fair amount of flack from the locals when it turns up but for us it’s a dream come true!